Anyway, here it is the AidPod Mark V. It’s the same as the Mark IV but about half its length. This means it will be cheaper to produce and will carry the items needed to treat just one episode of diarrhoea (not two). We will be able to get 10 of these into a crate. Our research tells us that a key determinant of whether a child is given ORS is whether ORS is available in the home at the time the diarrhoea strikes. This led us to think that it would be a good idea to include sufficient items in the AidPod to treat two episodes of diarrhoea. However, more compelling evidence indicates that people living in poverty cannot afford to buy and store. In the slums of Nairobi, they don’t buy tubes of toothpaste, they buy a squirt of toothpaste on their toothbrush when they need it. We think that having AidPods available in the nearby retail kiosk at an affordable price will be nearly as good as having it in the home. The trial will help us determine whether this is the case. 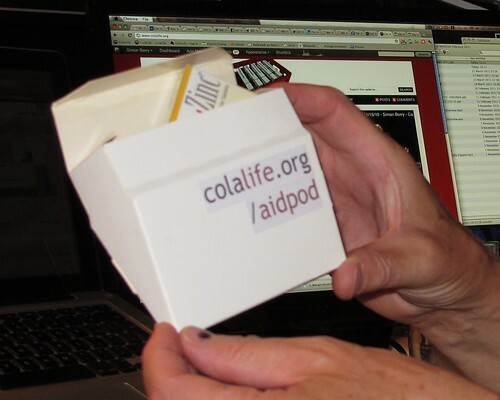 For a more in-depth discussion on why we are going for a smaller AidPod please see this previous blog post.